Author(s): M. Nuzaihan M.N., U. Hashim, A. Rahim Ruslinda, M.K. Md Arshad, M.H.A. Baharin. Nano Biochip Research Group, Institute of Nano Electronic Engineering (INEE), Universiti Malaysia Perlis (UniMAP), 01000 Kangar, Perlis, Malaysia. Silicon nanowires based biosensors have garnered great potential in serving as highly sensitive, label-free and real-time response biosensing application. These biosensors are useful in detecting pH, DNA molecules, proteins and even single viruses. In this paper, we report the geometrical characteristics and performance of silicon nanowires array for pH level detection. The nanowires are designed for 40 nm, 50 nm and 60 nm diameter sizes. Top-Down Nanofabrication (TDN) is utilized in the development of resist mask and nanowires formation from silicon on insulator (SOI) wafer involving scanning electron microscope (SEM) based electron beam lithography (EBL). The smallest silicon nanowires structure achieved is 40 nm width and 30 nm height. The corresponding source and drain are fabricated via two aluminum (Al) electrodes on top of the silicon nanowires array using conventional lithography process. A 100 μm microfluidic channel is attached on the silicon nanowires for the sample solution transportation. pH level detection are performed based on several types of standard aqueous pH buffer solutions (pH 4, pH 7, pH 10 and pH 12) to test the electrical response of the sensor. Morphological and electrical responses have been proposed to verify the characteristics of the silicon nanowires array based pH sensor. Keywords: Array, E-beam lithography, microfluidic channel, pH sensor, silicon nanowires. Affiliation:Nano Biochip Research Group, Institute of Nano Electronic Engineering (INEE), Universiti Malaysia Perlis (UniMAP), 01000 Kangar, Perlis, Malaysia. Keywords:Array, E-beam lithography, microfluidic channel, pH sensor, silicon nanowires. 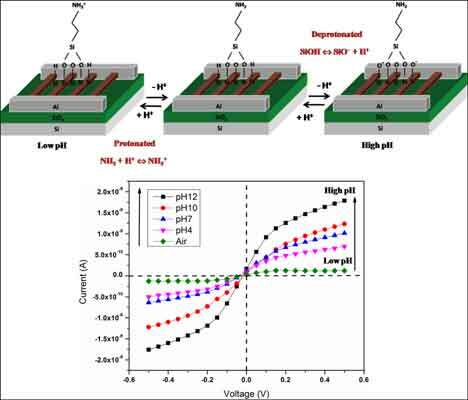 Abstract:Silicon nanowires based biosensors have garnered great potential in serving as highly sensitive, label-free and real-time response biosensing application. These biosensors are useful in detecting pH, DNA molecules, proteins and even single viruses. In this paper, we report the geometrical characteristics and performance of silicon nanowires array for pH level detection. The nanowires are designed for 40 nm, 50 nm and 60 nm diameter sizes. Top-Down Nanofabrication (TDN) is utilized in the development of resist mask and nanowires formation from silicon on insulator (SOI) wafer involving scanning electron microscope (SEM) based electron beam lithography (EBL). The smallest silicon nanowires structure achieved is 40 nm width and 30 nm height. The corresponding source and drain are fabricated via two aluminum (Al) electrodes on top of the silicon nanowires array using conventional lithography process. A 100 μm microfluidic channel is attached on the silicon nanowires for the sample solution transportation. pH level detection are performed based on several types of standard aqueous pH buffer solutions (pH 4, pH 7, pH 10 and pH 12) to test the electrical response of the sensor. Morphological and electrical responses have been proposed to verify the characteristics of the silicon nanowires array based pH sensor.